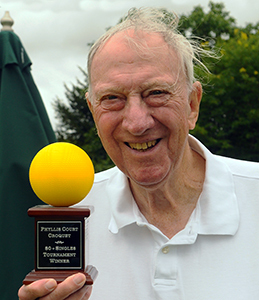 Raymond Wood had three close shaves at 7-6 but emerged with a perfect 5 out of 5 victory record to retain the 80+ Singles tournament title that he won last year. Six players took part today on a thankfully cooler day than we have endured in recent weeks. With he exception of Wood, the other players all took wins against each other leaving the winner decided even before the last round. Ralph Chambers was a clear runner-up with three wins and the rest of the field all scored one or two.